This is a very flavorful meatless entree that would be a great option for Meatless Mondays. 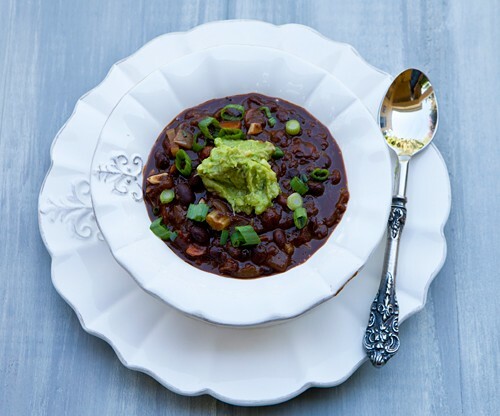 The addition of the smoked ancho pepper, smoked paprika, and dark chocolate cocoa really adds a great depth of flavor and just enough bite to keep the dish interesting. If you are preparing this chili for kids who do not care for spicy food, you can simply leave out the chili. You can find the canned Chipotle peppers in Adobo sauce in the Mexican food section of most grocery stores. 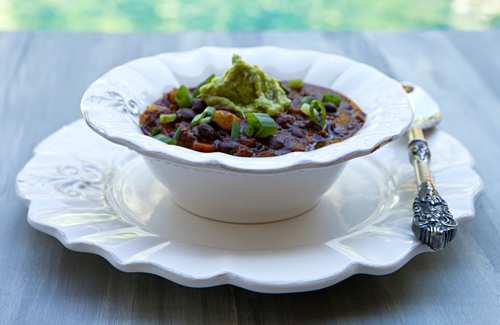 Loading this chili up with vegetables increases its fiber and antioxidant content. 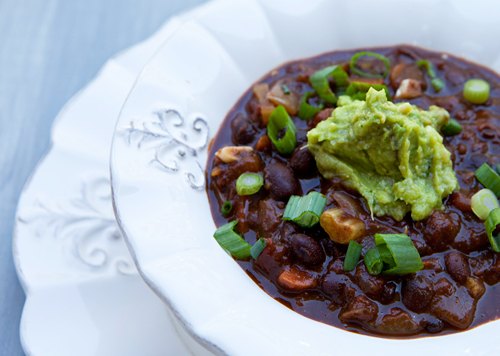 Black beans provide and excellent source of fiber and are nutrient rich. A hearty meatless entree that has a delicious depth of flavor. Heat the oil in a heavy saucepan over medium heat and cook the onions, carrots, and celery until tender. Add the black beans, tomatoes, chipotle peppers, cilantro, cumin, cinnamon, paprika, salt and pepper. Bring to a boil, then reduce the heat to a simmer and cook for 1 1/2 hours. Stir in the cocoa, and serve, garnished with the chopped green onions and a dollop of guacamole.